Located only 4 miles outside of Saint Lucia’s capital, Castries, is the breathtaking destination of Marigot Bay. This picturesque region is surrounded on all three sides by high-rising forested hills and is historically known for being the site where the British and French navies clashed over rule of the island. Marigot Bay has a long history of attracting outsiders. The region has been referenced multiple times in pop culture with the all-girl group Arabesque featuring the song “Marigot Bay” on their correspondingly titled album. The bay was made famous as the setting for the “giant pink sea snail” scene in the 1967 Rex Harrison movie, Doctor Doolittle. It was later described as “The most beautiful bay in the Caribbean” by American novelist James A. Michener who wrote a chronicle of the islands in 1989. The northern side of Marigot Bay is exclusively accessible by boat but free water taxis make the wonders of the bay easily accessible. This region is the home to a hosts of resorts and private residences, but the last thing you would want to do as a tourist is sit in your room. Visitors have the freedom to journey up the winding roads to the top of the north side and take in the striking view of the miraculous bay. Hiking through the forested hills on the south side has also long-served as a popular escape amongst more adventurous travelers. This allows you to fully immerse yourself in the island and witness first-hand the glorious sites Marigot Bay has to offer. Kayaking through the alluring mangroves located around the bay is also very popular. It serves as a stimulating opportunity for tourists to trade in the hilly mainlands for a relaxing coast through Saint Lucia’s clear waters. 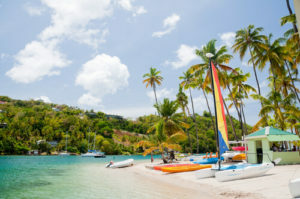 The beauty of the bay has been safeguarded by the steep, timbered hills for decades and has allowed Marigot Bay to survive some of the most treacherous conditions over the years. Allowing visitors to enjoy this beautiful region for years to come. The options for exploring Marigot Bay are endless. Trust Dave Charles Taxi and Tours to provide you with an exceptional tour of Marigot Bay. Contact us at 1-758-715-3573 or use our form online to book your next tour of Marigot Bay!